Pink is everywhere these days. 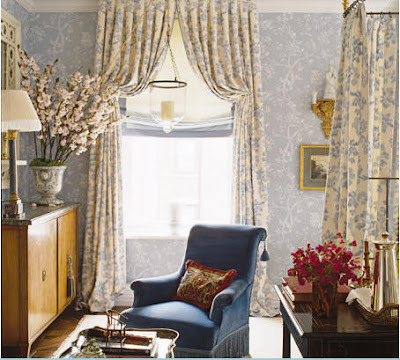 Southern Accents reported that at the spring home show in Paris, the deeper pinks - the berry pinks - overtook everything and if you didn't have something in this color yet, you will by next year. 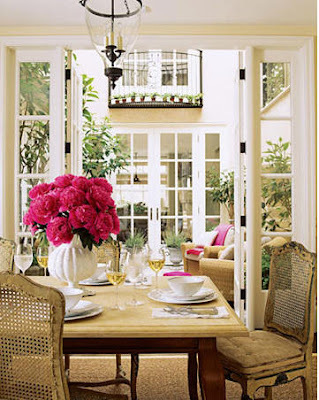 Patricia Gray has a beautiful blog on pink today, so be sure to visit her! Sometimes, though, all you need is a touch of pink to get the soothing effect that light pink gives or the pop of a brighter pink. Here are some pictures with just that touch. Pink shows up on an accent wall and in the flowers. 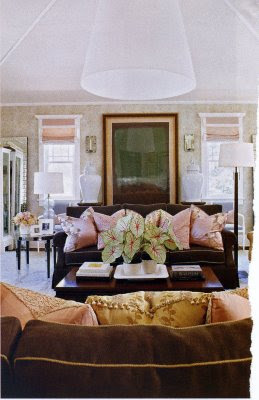 Pink pillows on brown upholstery with the same pink caladiums that have overtaken my yard. 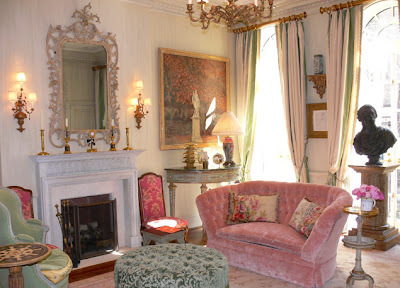 Charlotte Moss' gorgeous pink velvet settee with pink chairs flanking the fireplace. Houstonian designer Pam Pierce uses pink, but just barely. 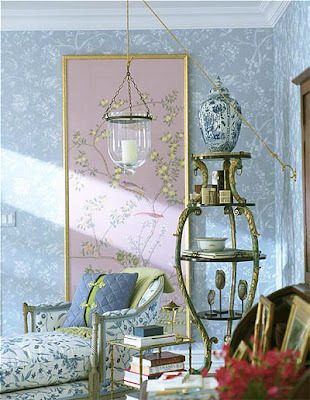 Ah, my favorite house by Kurt Aichler (see previous post): a daughter's bedroom with a darling Indulge headboard and pink wainscoting wrapped round. Deeper tones on the ottoman/coffee table juxtaposed against all white. Charlotte Moss brings out pink in the flowers and pillow. Pink and yellow, a beautiful combination. Note how the flowers pick up the hue in the atrium. 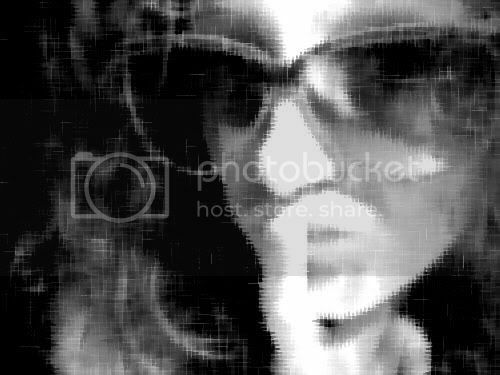 Good photostylist. Ha - my porch! Styled with pink flowers. Now THIS is the work of a great photostylist!! Pale pink flowers to tie in the pale pink slipcover and drapes. Peonies and blue and white porcelain, the best combination. > Wow! A home for sale in Houston. Those are some azaleas! I love the blue pool against the pink. Do you think they keep those gorgeous daybeds out there all summer? Beautiful. I love your post on Pink. Just a touch is great. Most of all I like your porch!!! What a fun color this is. great post and some wonderful images. Thanks Patricia, your support means the world to me. Your porch is stunning. Really loved the white room with the massive mirror and Charlotte Moss's of course. Thanks for posting! 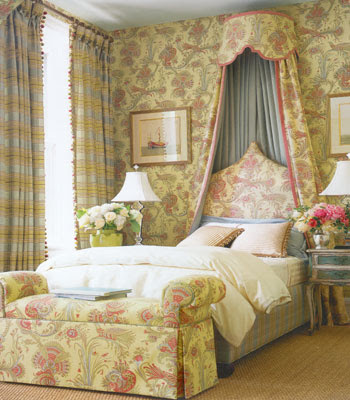 Love the Indulge headboard. Is that a store in Houston? Do they have a web-site? Yes, the headboard comes from this wonderful store called Indulge in Houston. I'll blog about it because it's special. Thanks for the comments. i LOVE them!!!!! I Love your porch! That IS a great photo stylist! 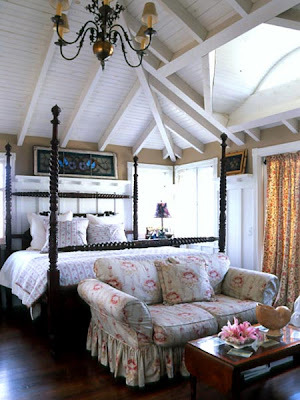 Wonderful images: I love the dining room, and bedroom, and, and..... Thanks for the imagary! Shoot... i wish i had seen your porch pix when i did my post on white wicker. it would have been prefect. Thanks for the comments, y'all. I did that porch really on the cheap. The chairs came from Pier I and the pillows came from Pottery Barn this summer. I picked up the rug from -- ok, totally blanking on the name of the catalogue! Embarrassing! And the garden seat is from the amazing Wisteria. 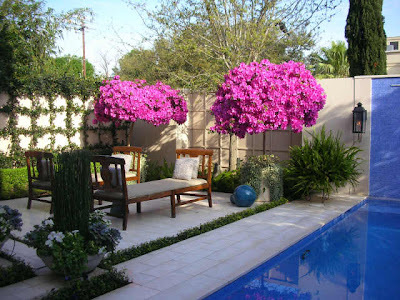 Those azaleas are amazing! And of course your porch is beautiful!!! Very good photostylist indeed!